Note: Colorado and Oregon users: The information on this page isfairly lengthy and may not be completely displayed on your GPS. You should print this page before attempting the EarthCache. 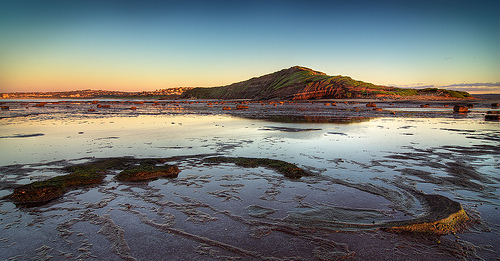 To claim this EarthCache you must visit site during calm seas, daylight hours and at low tide. Check Sydney tides and the Bureau of Meteorology for more details Please do NOT attempt this EarthCache if these conditions are not met. Disclaimer: Always exercise common sense and caution. You assume all risks arising in connection with seeking this EarthCache or any other related activity. To reach this EarthCache please park at S33° 44.346 E151° 18.706 (See additional waypoint) and follow the marked trail to the location of the EarthCache. If when you approach the EarthCache the sea is rough, and it's too dangerous to be close to the reef, please try again when conditions improve. 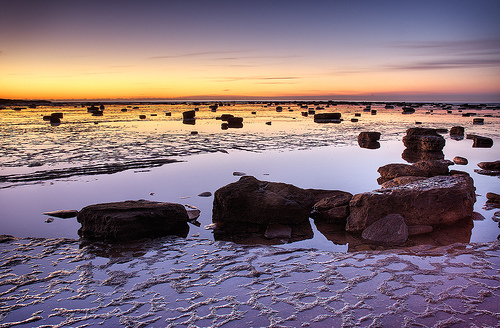 The rocks which comprise Long Reef are quite varied dating back for as many as 230 million years. The most common rocks on the reef are all sedimentary types: sandstones; claystones and shales. The sandstones are part of the Hawkesbury Sandstone formation which covers the entire Sydney region and well beyond. The Hawkesbury Sandstone is comprised of quartz, silicons, feldspar, clays and iron compounds. These were deposited in the region around 200 million years ago by a massive series of rivers flowing from a mountain range in central Antarctica, which at that time was joined to Australia as part of the super continent Gondwanaland. Hawkesbury sandstone is up to 200 metres thick, which provides a good indication of the robust river system which effectively moved a mountain range from one part of a continent to another. 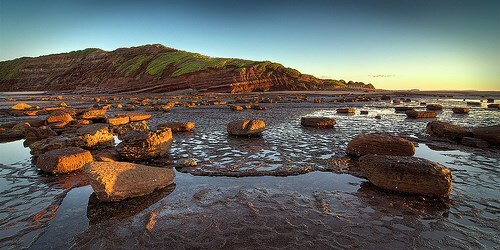 Near the eastern end of Long Reef a portion of a volcanic dyke can be found. This is around 1 metre wide and composed of the igneous rock, Dolerite. 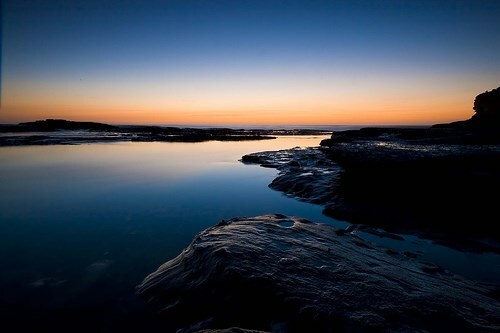 The reef itself is a large area of flat rock planed off to about sea level by wave erosion. 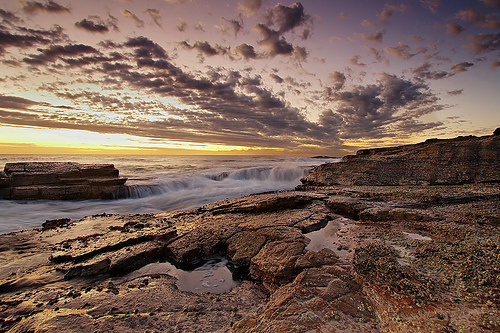 Many such "reefs" occur around Sydney but Long Reef is one of the largest and best known of them. Marine invertebrate life is highly diverse and abundant on Long Reef. Much of this can be found in the littoral belt, between the highest part of the spray zone and the lowest level of the spring tides along the shoreline. The species found furthest up the shore have little if any exposure to wave action. Blue and Nobby Periwinkles live here and are capable of surviving without immersion for long periods of time. These tiny snails graze on microscopic algal film covering the rocks, and sometimes are present in large numbers. The mid-shore is subject to fluctuating tide conditions. It attracts a variety of organisms that are able to withstand immersion in water and exposure to the air between tides, high salinity following evaporation and very high and low temperatures. It appears that this is the tidal zone which is mostly exploited by the waders, which forage during low tides. Species living in the mid-shore range include anemones, barnacles, limpets, chitons, grazing snails or gastropods, nudibranchs, crabs, sea stars, sea urchins, worms, cockles and even pearl oysters. Large meadows of Neptune's Necklace cover most of the northern section of the reef. The subtidal region is covered by the sea most of the time. Similarly to the many rock pools on the reef, it contains a large variety of marine fauna, such as sea urchins, large gastropods, encrusting sponges and anemones. On the upper fringes of this region, colonies of tube worms, larger barnacles and cunjevoi or sea squirts are also found. The whole subtidal area has extensive kelp beds where Leafy Sea Dragons can be observed by divers. A number of migratory waders can regularly be found on the reef, including: Ruddy Turnstone; Grey-tailed Tattler; Red-necked Stint and; Pacific Golden Plover. These birds roost at high tides on the extreme eastern end of the reef which, at that time is safely separated from the shore by a broad expanse of water. At low tide the waders move among the freshly exposed mid-shore of the reef, where they feed upon the many invertebrates which live among the cunjevoi, Neptune's Necklace and other algae. A non-migratory member of the wader group, the Sooty Oystercatcher, also frequents the reef, roosting with the other waders at high tide and foraging for shellfish and sometimes cunjevoi at low tide. Penguins are occasional visitors to Long Reef. Other birds which frequently visit the reef include the Australian Pelican; Little Black Cormorant; Pied Cormorant; Great Cormorant ; Little Pied Cormorant; White-faced Heron; Silver Gull and; Crested Tern. These birds tend to use the reef more as a site for roosting or launching foraging sorties into the nearby waters. 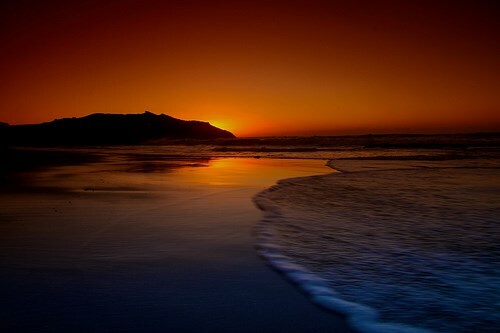 Little Penguins may occasionally drop into the reef to spend the night resting on the shores. These birds generally depart again before sunrise. Further offshore large numbers of shearwaters, prions, albatross and petrels can be observed, especially when the wind is blowing from the south-east. Occasionally, a Wedge-tailed Shearwater may fly over the reef or a Black-browed Albatross fly close enough to the shore for observers to appreciate the splendour of these species which seldom come to land. Answer the following questions and email them to me. Do not post the answers in your log. 2) Taking into account question 1 and by looking closer at the reef; What was the main contributing factor to the formation of the entire reef(Rock formation)? e.g. volcanic, wind erosion, water/wave erosion, shifting sands, sediment build up, corrosion caused by the dissolving of rock by carbonic acid in sea water. 3) Do you see any parts of the reef/shoreline that were caused by hydraulic action? "Hydraulic action is a form of mechanical weathering caused by the force of moving water currents rushing into a crack in the rockface. The water compresses the air in the crack, pushing it right to the back. As the wave retreats, the highly pressurised air is suddenly released with explosive force, capable of chipping away the rockface over time. Thus, the crack is gradually widened so the amount of compressed air increases like a balloon, and hence the explosive force of its release increases." 1) Describe at least one type of bird or marine life you see during your visit. If possible, take a photo of the “life form”. For bonus points also submit the scientific name of the “life form” you find. 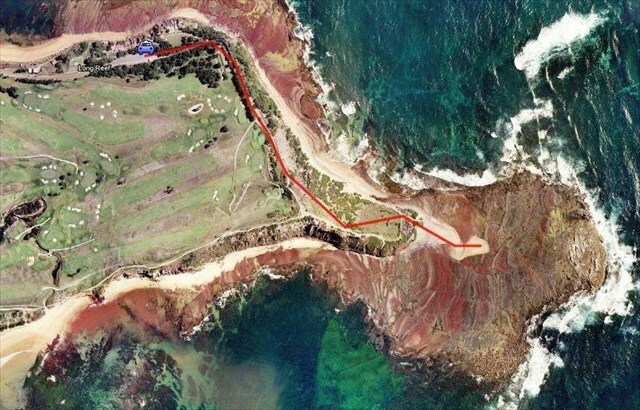 2) Upload a photo of yourself (or group) with your GPS and the reef/rock clearly visible. There is no need to wait for a confirmation email to log this earthcache. I read all emails to verify the correct information was sent and will contact you if there are any problems with your answers. Likewise, there is no need to email me photos. Just upload any photos with your log. If both tasks are not completed within a timely manner of logging your cache online your log will be deleted. Disclaimer: Always exercise common sense and caution while geocaching. Any person attempting this cache and/or any related activities assumes all liabilities and personal responsibility for any and all damages or injuries of any kind. If you do not agree to these terms and conditions, do not attempt for this cache.